An ingenious drone delivery service known as “Uber for blood” has slashed the delivery time of life-saving medicine to remote regions of Rwanda from four hours to an average of half an hour. A partnership between Zipline, a Silicon Valley robotics company, and the country’s health ministry has delivered more than 5,500 units of blood over the past year, often in life-saving situations. Never before have patients in the country received blood so quickly and efficiently. While commercial drone delivery in wealthier countries is still at the testing stage, hampered by busy skies and strict regulations on airspace, Zipline is delivering blood to 12 regional hospitals from a base in the east of Rwanda. Each hospital serves about half a million people. The use of drones is helping to reduce maternal deaths – a quarter of which are the result of blood loss during childbirth – and high incidences of malaria-induced anaemia, which is common in children. Drone delivery also means hospitals can store less blood, which means less waste as blood spoils quickly. Now Zipline plans to work with the government of Tanzania, a country of 56 million people, to launch what it claims is the world’s largest drone delivery network. Keller Rinaudo, Zipline’s co-founder and chief executive officer, said the move will make east Africa a world leader in drone logistics. The idea for the drones came during a visit Rinaudo made to the Ifakara health institute in Tanzania, in 2014. He met a graduate student who had built a mobile alert system for health workers to text emergency requests for medicine and vaccines. A network of community health workers used the mobile alert system to make thousands of requests. But there was a problem – there was no way for the government to fulfil these requests. “It became clear that this was a database of death filled with thousands of names, addresses, ages and phone numbers,” said Rinaudo. This year, the firm aims to deliver a range of medical products – including blood transfusion supplies, HIV medication, antimalarials, sutures and UV tubes – to four bases in Tanzania, supporting more than 1,000 clinics. In Rwanda, when a doctor or medical staffer at one of the 12 clinics needs blood, they send a WhatsApp message or log on to Zipline’s order site. They are then sent a confirmation message saying a Zip drone is on its way. 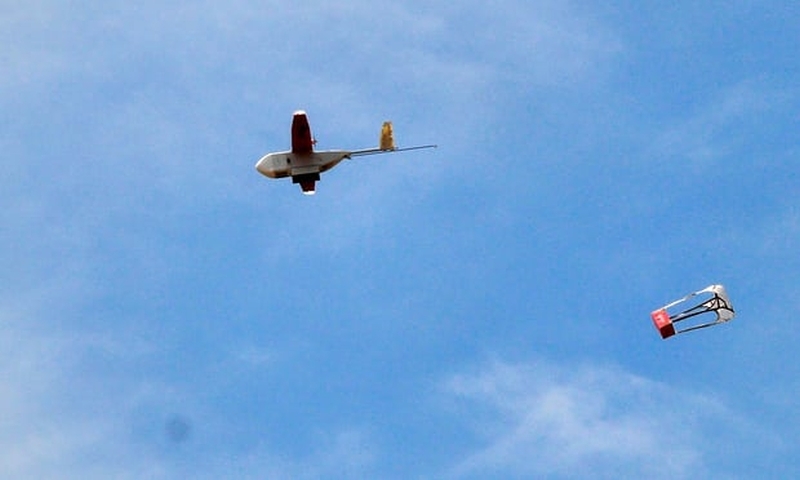 The drone flies to the clinic at up to 60mph. When it is within a minute of the destination, the doctor receives a text. The drone then drops the package, attached to a parachute, into a special zone near the clinic before returning to base. Critics of the scheme in Rwanda have questioned why the authorities have invested in hi-tech schemes when demand for basic infrastructure, roads and health centres still exceeds supply. Zipline and the government have not revealed the cost of the project.